This entry was posted in Animals, Birds, Black & White Images, Buildings, Clouds, Flowers, Germany, India, Italy, Kenya, Landmarks, Landscapes, Moon, Nature, People, Photographic Art, Photography, Reflections, Sunrise, Sunset, Tanzania, Travel, Unusual Perspectives, Yosemite National Park and tagged Gratitude, thanks. Bookmark the permalink. Hello, Ravi! Congratulations. Your accomplished achievements are splendid. This depends completely on your high quality photographs. That’s an incredible set of statistics. Very well deserved. It amazes me how you manage to drag that Tripod, camera, black cloth and hand-held flash thing all over the place and still get such great shots. Ark, it is all about the passion of photography! I wish I had a Hasselbrad – just Canon DSLRs! Congratulation and I look forward to more great photos. Congratulations on the success of your blog. I enjoy your photos immensely – including this one! Thanks so much Pat. I really appreciate your comments to my various posts. Thanks so much for your kind comments Ellen! Congrats on your blogging success and another amazing image. Thanks for your kind comments Melanee! Great photos Ravi, and great blog numbers – congratulations and keep up the wonderful work you do. It has been a pleasure to follow your blog, Ravi. Congratulations on a successful year! Thanks so much for your comments PK! Congratulations on an amazing year! I enjoy your blog very much! Thanks so much. I am so glad you are enjoying my blog. Congratulations on a year! And don’t you just want to scratch this guy – help him scrape the old stuff off?! Thanks Sister Pat! 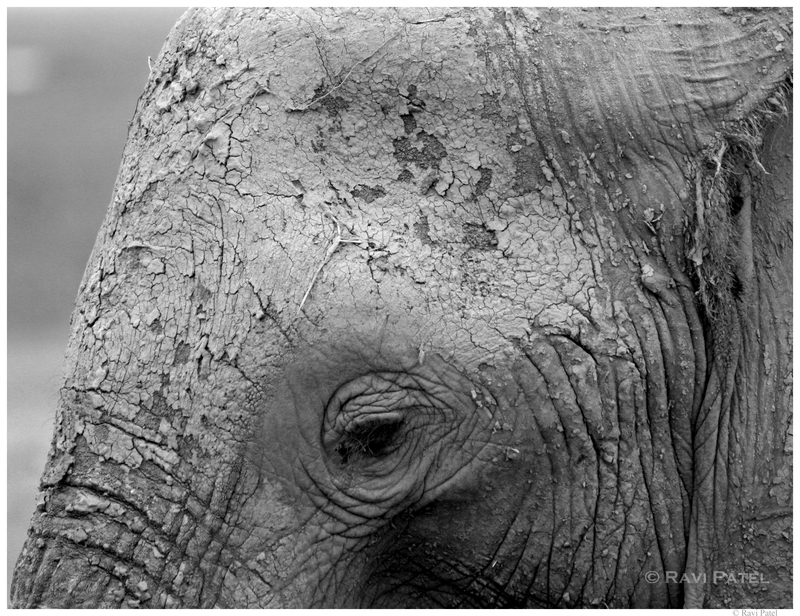 Lots of baked mud on this elephant – would need a very strong brush! Congrats Ravi. Elephants eyes are just marvelous. Good capture.